Kohlrabi, also known as "German turnip," is a cultivar of cabbage and so named because the bulbous stem resembles a turnip. Both the stem and the leaves are edible, and the vegetable can be eaten raw as well as cooked. Kohlrabi has a sweet and mild taste, similar to cabbage heart and broccoli stem. 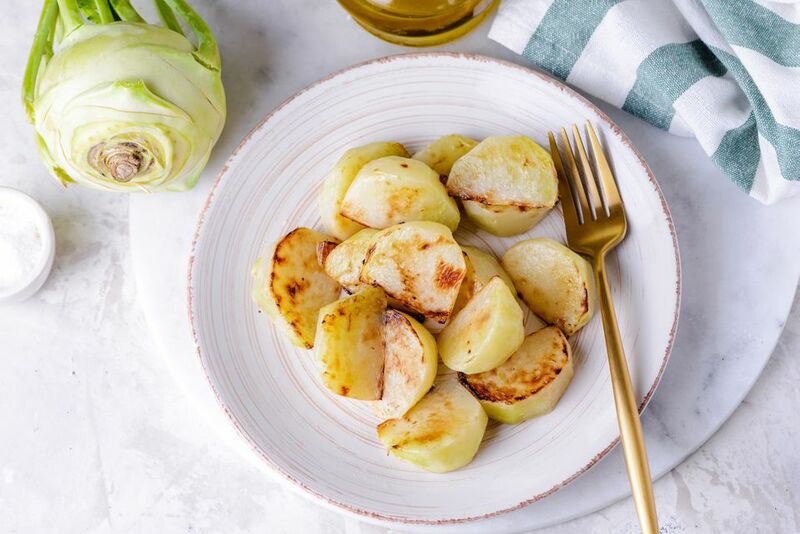 For people already familiar with the brightly flavored and crispy raw kohlrabi, the tender caramelized sweetness of this hearty vegetable will be a delightful discovery. It's delicious on its own, but feel free to add some fresh herbs when you serve it, or a drizzle a bit of balsamic vinegar to bring out even more of its natural sweetness. A sprinkle of Parmesan cheese is also a delicious finish to this dish. Cut the peeled kohlrabi into evenly sized wedges or chunks. Put those chunks in a roasting pan and drizzle with the olive oil and toss to coat the kohlrabi. Sprinkle with salt. Cook until the kohlrabi is tender, with plenty of browning on the edges - about 30 minutes. Although roasting vegetables is one of the easiest cooking techniques, there are a few tips you will want to follow to assure the best outcome—meaning, tender on the inside and crispy and caramelized on the outside. First, be sure your oven is hot enough; 375 F is optimal, but you will have success when the temperature is anywhere between 350 F and 42 5F. If you have a convection oven, use the convection roast setting, as the circulating heat will help cook all sides of the vegetables as well as the center of each piece. And when it comes to cutting the vegetables into pieces, make sure they are all relatively the same size so they cook at the same rate. It is also important you don't crowd the pan; pieces of food that are too close together will end up steaming rather than roasting. To achieve that beautiful golden brown on all sides, move them around a bit with a spatula or shake the pan and turn the vegetables about half-way through cooking time. If they seem to be darkening quicker than they are softening, cover the pan with foil and continue roasting until tender. In addition to tossing in oil and salting before going into the oven, you will want to salt—and perhaps drizzle with a flavorful oil—once the vegetables are cooked. This gives them a full-rounded flavor and brings out their natural nuttiness and sweetness.